Fox Kling-Ons have been CAD designed for optimum performance. Both sides of the lead are textured and feature pronounced studs which grip just about any type of bottom. This makes the design ideal for river fishing, holding position on sloping bars and island margins or for positioning rigs at range by boat. The flattened profile prevents rolling and stabilises the lead while the compact centre of gravity enhances the bolt effect of the rig. 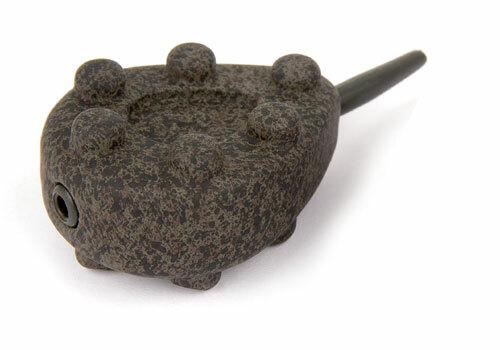 Available in quarter ounce increments to suit every possible scenario, the Kling-On Swivel Lead is finished in a matt, non-reflective ‘clay brown’ with gravel speckles ensuring it will blend in discreetly with just about bottom.